This article is the 4th in my series about the 2018 Sea Doo innovations. Article 1 is a general overview. My 2nd post is about the new ST3 Hull. #3 talks about the various storage ideas. And now this one speaks to the many Sea Doo platform features on the deck around the rider. The 2018 GTX, RXT and Wake Pro 230 model shared these platform features. All are 3-seaters. Most obvious is the new reconfigurable and removable rear seat with side passenger handles. It slides back to make a separate place to sit when the watercraft’s not in motion. Or it comes right off to open up a large swim platform or lounging deck. When I ride 1-up on Sea Doo tours next summer, I’ve thought of riding without the rear seat. But that begged the question, does no rear seat mean no ski tow eye or rear grab handle? Remember previous models. These standard items were part of their fixed rear seat configuration. Never fear, I’m good to go single seated! The new Sea Doo platform features include a new ski tow eye. It’s now located at the back centre edge of the rear deck. It’s rated for the same weight capacity as previous models. So if you ever have to tow another watercraft, no problem (assuming you have a proper rope). It’s also great for pulling inflatables. But for serious water-skiing or wakeboarding, check out the new ski pylon below. Meanwhile, the rear grab handle that assists riders with re-boarding is now recessed into the rear deck. So it tucks away when not in use. This location is actually easier for most folks to reach and use. Especially when using the redesigned boarding ladder. It’s an inch deeper and also wider. Plus, it’s mounted lower for better access. It’s also supposed to be easier on your knees or feet while climbing on. 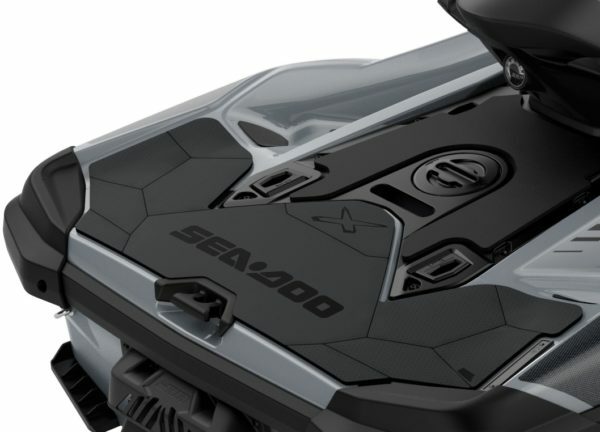 The new Sea Doo platform features a larger rear deck. It offers two other integrated and recessed innovations. One is a recessed set of LinQ attachment brackets for fuel caddy & cargo bag or cooler as described in my Sea Doo storage ideas article. The other is a specially designed bracket shaft to securely insert a new LinQ retractable Ski Pylon. This strong and sturdy accessory really improves the tow sports capability of the GTX and RXT models for 2019 too. So what about access to the watercraft’s innards? 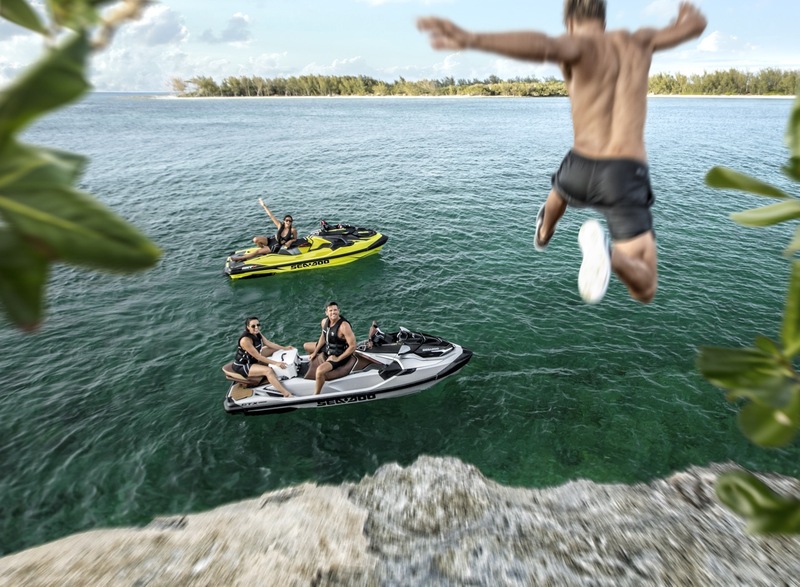 The new Sea Doo platform features make this dead simple. A maintenance panel under the operator’s seat provides easy and direct access. Here, you’ll find components like battery, oil stick, coolant level and fuses. This is also where the water intake hose can be clamped shut if it’s necessary to tow the watercraft. Meanwhile, access to the engine compartment is under the rear seat. I’m informed that this provides Sea Doo technicians with the largest opening ever for easier repair work. One other item among the various Sea Doo platform features gets moved. The integrated cleats are for mooring ropes. These cleats used to be located under and at either side of the handlebars on the GTX, RXT and Wake Pro 230 models. But with the handlebars now lifting for front storage access that had to be rethought. So now there’s an integrated cleat on each side slightly forward of the new audio speakers. And it’s a new shape, easier to attach a dock rope.